Game of Thrones just aired the first episode of its final season and with only five more to go, it may not be too long before for the home media release of Season 8. Some of us have been waiting diligently for a complete collector’s set of Blu-ray Discs — foregoing the temptation to buy Seasons 1-7 in the 7-disc set released last summer. (We even asked: Why would you buy this collection?) Warner did the same thing a year earlier for Seasons 1-6 in that beautifully-packaged 6-disc box set with mosaic artwork on the slipcover. But a full collected edition of all seasons was inevitable, and that boxed set has popped up on Best Buy for $259. Game of Thrones: The Complete Collector’s Set is boxed in all black and labeled as a Limited Edition, likely containing some special features from past Blu-ray editions (like commentaries) but maybe not all bonus material considering the number of discs required for each season. It was surprising, in retrospect, that a boxed set was released containing only Seasons 1-7 with full awareness the last season was on the way. Warner/HBO could have included extra space in the edition which would have made the box set complete (like the way the Bond 50: James Bond Collection included a disc sleeve for Spectre which hadn’t hit theaters yet when the collection was released). But that collection was much different. 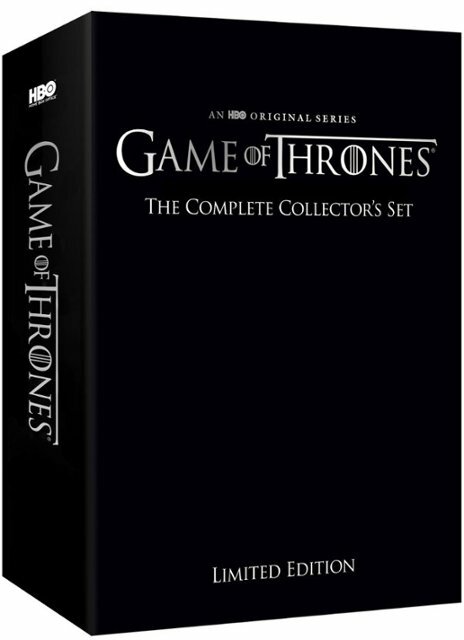 The GOT Seasons 1-6 and Seasons 1-7 collections were simply made up of bundled single-season Blu-ray cases. Unfortunately, there hasn’t been any word of a full collector’s set of Ultra HD Blu-ray discs with episodes presented in 4k/HHDR, even though Season 1 is available in 4k (now on sale for only $29.99). An entire collection in 4k would likely be much more expensive than the standard Blu-ray set, as mentioned above priced $259. The price on Best Buy should eventually drop. We expect Game of Thrones: The Complete Collector’s Set to end up $159 or $179 once the smoke clears. A 4k Blu-ray boxed set would likely cost an extra $40 or so. However, considering Seasons 2-7 have not been released to 4k Blu-ray yet that collection may be at least a year away. We’ll keep you posted as we learn more about this boxed set of the entire Game of Thrones series from Warner Home Media. That’s not a very competitive price given the Season 1-6 box set can be had from Amazon UK imported for about $90 US right now (maybe $100-120 buying in the US itself) and even having to buy the final two seasons, it’d still cost close to $80-$100 less than that Best Buy set. Being limited edition, it better have something amazing extra in it at that price, IMHO.